Americans eat 46 million turkeys every Thanksgiving and eat about 535 pounds of turkey meat. The average turkey day gobbler weighs 16 lbs. On average, they are 70% white meat and 30 % dark meat. White meat and dark meat are in fact, very different. Dark meat has about twice the fat and contains saturated fat. While eating white meat may save you a few calories (only about 45 per serving), you’ll miss out on the darker meat’s vitamins, including B6 and B12, iron and zinc. It was Abraham Lincoln who mandated Thanksgiving a national holiday in 1863. It was originally on the last Thursday in November, but in 1941 Congress changed it to the fourth Thursday in November. Despite the narrative we see in books and school plays, the first American Thanksgiving didn’t take place in Plymouth Colony, Massachusetts but in 1541, when explorer Francisco Vasquez de Coronado and his followers held a thanksgiving celebration in Palo Duro Canyon in Texas. In fact, there are claims of 12 different Thanksgivings in the Americas before the pilgrims celebrated in 1621. Hawaiians celebrated the longest Thanksgiving in the world, called Makahiki, which lasted from November to February and was a time where both work and war were forbidden. 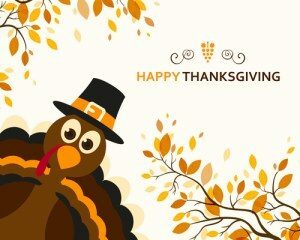 The Pilgrim’s first Thanksgiving in 1621 took place some time between September 21 and November 1. 50 surviving pilgrims and 90 Wampanoag Indians celebrated for three days, feasting on berries, shellfish, boiled pumpkin, and deer. 91% of people eat turkey on Thanksgiving, leading us to the question: who doesn’t eat turkey on the Thanksgiving holiday, vegetarians? People eat 768 million pounds of cranberries every year, and 26 percent of that is on Thanksgiving. Cranberries are only one of three fruits native to America. The original Native Americans didn’t eat them but used them to dye clothes and treat arrow wounds. 50% of Americans put their stuffing inside their turkey. A strange Presidential tradition exists in which two turkeys are “pardoned” from Thanksgiving every year, sparing them from the dinner table. This tradition started when Abraham Lincoln pardoned his son’s pet turkey and every U.S. President does the same since 1947. The first Thanksgiving Day parade took place in 1920, when Gimbel’s department store in Philadelphia threw a parade with 50 people – including Santa Claus at the end. It’s now known as the IKEA Thanksgiving Day Parade. The Macy’s Thanksgiving Day Parade started in 1924 and is the nation’s largest, with 3 million people watching live and 44 million viewing on TV. The days around Thanksgiving are generally the busiest travel days of the year as people head home for the holiday. But interestingly enough, Thanksgiving Day is the most popular travel day, not the day before. Every year, almost 40 million Americans travel at least 50 miles to get home for turkey dinner. Black Friday is also the busiest day of the year for plumbers, according to Roto Rooter. TV dinners actually originated because of a Thanksgiving Day mishap. In 1953, someone at Swanson’s misjudged the number of frozen turkeys they needed for the holidays by 26 tons! Instead of losing the extra meat (and money) they had the bright idea to slice up the turkey, add some side dishes, repackage it as a frozen dinner in foil packaging, and start marketing it to people who wanted to eat easy meals in front of their televisions. Astronauts Buzz Aldin and Neil Armstrong ate turkey during their first meal on the moon. The tradition of Thanksgiving Day football games started in 1876, when Yale played rival Princeton. The National Football League embraced the tradition of playing games on the national holiday starting in 1920. The Dallas Cowboys and Detroit Lions always host a game, and since 2006 there is another game with various opponents to be named before the season. Why always the Lions and Cowboys? Back in 1934, the Lions volunteered when they heard the idea of playing a Thanksgiving Day game, hoping to boost attendance and interest in the struggling franchise. The Dallas Cowboys did the same in 1966 and though they were already a successful team in years past, thought it would be a great way to spark a young coach named Tom Landry who was struggling that season. When President Franklin D. Roosevelt switched Thanksgiving to the next-to-last Thursday in November from the last Thursday to prolong the Christmas shopping season, Republicans were unnerved by the idea and refused to participate. So for a while there were two different holidays, Republican Thanksgiving on November 30 and “Franksgiving” or “Democrat Thanksgiving” on November 23. Sara Hale is considered the “Mother of Thanksgiving.” She was an editor and writer who lobbied persistently for President Lincoln to name a national day of thanks as an official holiday. She thought a Thanksgiving Day would unite the country amid turmoil about social and industrial changes. There’s really no reason turkey became the symbol of Thanksgiving and the main course. Wild turkeys were abundant at the first celebrated festival in Plymouth, but so were deer and other smaller game. Many people think that tryptophan, a chemical contained in turkey, puts you to sleep after you eat. But in fact, chickens have far higher levels of tryptophan, and the truth is that overeating just slows the body down and makes you feel tired. Few people realize that Thanksgiving isn’t only a holiday in the United States but Canadians celebrate it as well, only the second Monday in October.